Many of the world's current primary school-age children will live to see the human population on Earth pass the 10 billion mark. This will be a milestone of profound importance due to what it represents, but whether or not it is celebrated with fanfare or fright is very much in our hands. Today. Not tomorrow. 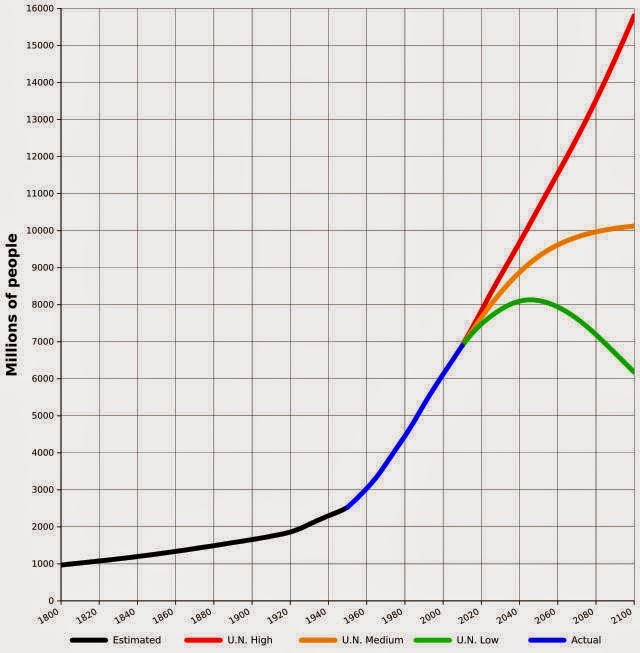 UN Economic and Social Affairs - Population Division models of possible future human population on Earth. The different model trajectories of red, orange and green underscore the importance of acting today to preserve tomorrow. Without any doubt, one of the greatest challenges facing many of these 10 billion people will be ensuring they have access to enough healthy food to eat. Malnourishment is already (and has been for quite some time) a severe problem and there are only 7.26 billion humans on the planet today (as of August 25, 2014). In the face of such challenges, protecting the world oceans, and the important food resources they provide, is not optional - it is essential. Fortunately, word is getting out. In June, 2014, the U.S. Department of State hosted the 'Our Ocean' conference in Washington, D.C. Both Secretary of State John Kerry and President Barack Obama made clear that a collaborative and international approach is required to protect our oceans - consistent with the integrated rescue package recently suggested by the Global Ocean Commission. From the 'Our Ocean' conference, June 16-17, 2014. In the South Pacific, word has been out quite some time. These, after all, are the people living on the front lines of ocean acidification, marine pollution, and declining fish stocks. Thanks to the passion, commitment, and courage of many Pacific islanders, Oceania hosts several of the largest marine protection areas in the world. The Cook Islands Marine Park - Marae Moana - is one of these. Indeed, the word is out, and the word is now. Learn more about the creation of the Cook Islands Marine Park - Marae Moana - by clicking on the above YouTube video. It represents a fantastic example of working together for the betterment of the ocean; precisely what we need more of around the world!